Review current and estimated fees and tuition charges for Brenau, in addition to just how these costs contrast to the U.S. average. Plan financially for your college degree. Contrast Brenau's tuition charges to other typical schools. Look for price developments and increases to find out if you should expect to set aside more resources for the following 4 years of tuition. How do Fees & Tuition at Brenau Measure Up To Other Colleges? For nationwide, regional and statewide comparisons, look at the following table to find out how Brenau compares to other colleges. In the 2017 - 2018 academic year, full time undergrads at Brenau were charged $28,510, before adjustments for financial need. $28,110 was the cost of tuition. The other $400 are added fees. Brenau University fees and tuition is the number billed to students for one year of attendance, and does not include room and board. Then again, a lot of students wind up having to pay below maximum tuition because they receive financial aid and other reductions. How much does Brenau cost part time? Check out the Part Time Tuition & Fees page for more info. There continues to be a rise of 5.0% in Brenau University fees and tuition for out-of-state students in the past five years. Tuition grew by 5.0% and fees grew by 0.0%. This school year, students can anticipate paying $29,927 if the growth keeps up. Because of price growth, the total expense of a four-year degree would be $128,931, and the total expense of a two-year degree would be $61,341, not including extra costs for books, transportation, and room and board. 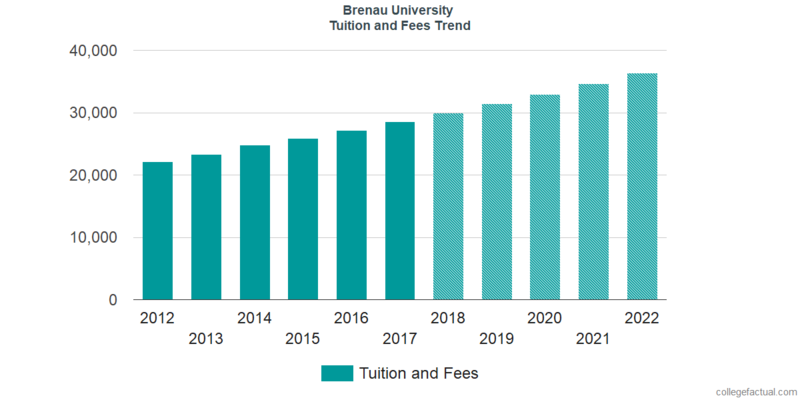 See the following chart to discern how Brenau fees and tuition may increase in the years to come. Due to the cost of living and other factors, the cost of college has a tendency to grow each year. For this reason your last year of school will be much more expensive than your initial year.